My keypad is locked and I cannot get it unlocked. Can someone help? I have looked everywhere and Tracfone is no help on the phone with them 2x's for over 1 hr they said they unlocked it not. Geeze I hate dealing with Tracfone bunch of idiots. Help please! On my 420g, the default unlock code is 0000. Try it out. If that doesn't work you may have to try resetting the phone. Unfortunately I don't have time right now to go into that. Hope this helps. I have included a picture. As you can see, my mine is currently inactive (unregistered SIM), but it should still serve the purpose here. I just got a tracfone and am slowly learning how to use it. I figured out the unlock steps above after a bit. However my phone seems to relock keyboard after something like 10 minutes of inactivity, and I have to go through the steps again. Since you don't have much time between when you press the unlock button and when you have to press the 'yes' button it normally takes an elderly person like myself a couple tries to unlock the damn keys again. Is the a setting on can use to completely disable this feature? I would rather my keypad never locked itself out. I just figured it out. When it says "keypad locked" press the bar over the green send button. It's under the word "unlock" then the screen will switch to ask you to select "yes" (you want to unlock) and press the bar over the red end. 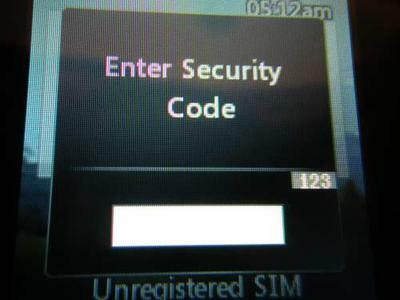 This unlocks the phone. It took me over 30 minutes to figure it out. To turn it on you have to press & hold the red end key, this also turns it off. You could also try the last 4 digits of your phone number if 0000 did not work.